Replace Wired Glass in Healthcare Facilities. This article describes why it makes sense to remove and replace wired glass which breaks easily with minimal human contact. The activity in healthcare facilities make injuries from wired glass more likely. It makes sense to replace wired glass in healthcare facilities. On a normal day, hospitals and healthcare facilities are abuzz with moving people and equipment. Imagine the added chaos during a fire. With all this activity, it is surprising to still find ubiquitous, unsafe wired glass in hazardous locations throughout today’s healthcare occupancies. According to the Capital Funding Buzz Survey conducted in November 2012, 47% of the responding hospitals and healthcare providers prioritize capital investment in upgrading existing facilities in the next 12-18 months. When renovating, healthcare executives and designers should give serious thought to replacing unsafe wired glass because it is incredibly fragile, breaks easily on impact and is likely to injury anyone who runs into or through it. Decades ago, unsafe wired glass was the only fire rated glass product available. Fortunately, today’s fire rated glass options include low-cost, clear glazing products that outperform traditional wired glass in both fire and impact safety. For over 100 years, traditional wired glass was the only fire-rated glass product available. It was mistakenly perceived as safety glazing because the embedded wires created an illusion of increased strength. The opposite is true. Wire actually weakens the glass making it about half as strong as ordinary window glass. In 1977, the Consumer Product Safety Commission enacted a safety glazing standard (16 CFR 1201) to protect people from injury due to accidental impact with glazing. Early on, building codes made an exemption for wired glass that failed to meet the CPSC impact safety standard. Since then, numerous clear, fire rated, impact safe glazing products have been developed, and modern building codes now require that glazing larger than 1296 sq inches in hazardous locations meet the Cat. II standard (which means that the glazing survives impact of 400 foot pounds.) The codes also require that when an existing panel of unsafe wired glass breaks, it must be replaced with a glazing product that meets the current safety glazing codes. There is one wired glass product that meets the Cat. II CPSC standard: SuperLite I-W, a low-cost patented, Cat. II safety-rated filmed wired glass product that works well as a replacement for unsafe traditional wired glass. Economical non-wired, Cat. II safety rated options include: SuperLite I, a clear tempered product for 20 min. 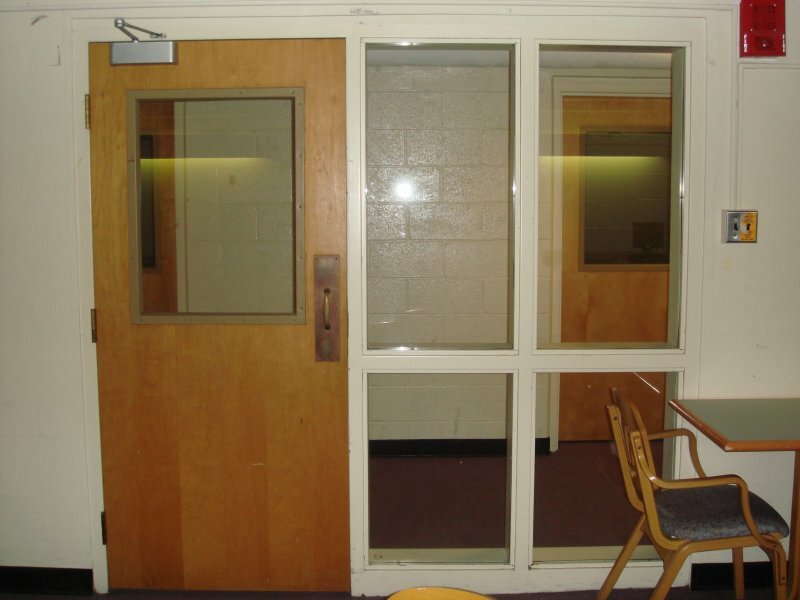 door vision panels and SuperLite II-XL 45, a clear fire resistive glazing product for 45 min. sidelites and openings. Further cost savings for 45 min. applications can be achieved with wire-free, clear SuperLite I-XL, a patented tempered product with partial radiant heat protection. SuperLite I-XL is fire tested without hose stream and may require AHJ approval for applications over 20 minutes. Several AHJs and the GSA have approved SuperLite I-XL for the additional value and cost savings it provides. All of these clear, wire-free, impact-safe fire rated glazing alternatives are not only affordable, but they match non-rated glazing elsewhere. Finally, filmed and laminated ceramics can also be used as an alternative to unsafe traditional wired glass. Of all the fire protective glazing options, however, ceramics are the most expensive. Many existing installations of wired glass not only fail to meet CPSC safety standards, but they may compromise the buildings ability to stop the spread of smoke, fire and deadly radiant heat when used in large sizes. In 1-hour exit corridors, wired glass installations cannot exceed 25% of the wall area. In 1- and 2-hour exit/stairwell enclosures, wired glass is prohibited altogether except as 100 sq. in. door vision panels. Why? Because wired glass, ceramic and specialty tempered products are classified as fire protective glass, meaning it compartmentalizes smoke and flames, but fails to block radiant heat transmission. These products are tested to NFPA 252/257 and are typically used in doors and openings up to 45 minutes. Fire protective glazing may not exceed 25% of the total wall area, and in 1- and 2-hour exit/stairwell enclosures vision panels of fire protective glass may not exceed 100 sq. in. If an architect wants to use fire rated glazing in excess of 25% of the wall area, or wants to increase the size of the vision panel in 1- and 2-hour exit/stairwell enclosures, fire resistive glass must be used. Unlike fire protective glass, fire resistive glass, such as SuperLite II-XL 120, is not limited in application or size because it compartmentalizes smoke and flames and blocks the transmission of dangerous radiant heat. It is tested to ASTM E-119/NFPA 251/UL 263 and is typically used in 60-120 min. applications. It provides floor-to-ceiling and wall-to-wall expanses of glass with maximum fire and safety when combined with an equally rated framing system, such as SAFTIfire GPX Framing. SuperLite II-XL can be customized to further protect against noise, attack, impact, bullets, blast, hurricane and UV rays. It is also available in any custom architectural make-up including enhanced energy performance applications.